A personal blog about my passion for all things quilty! I've been drawing a lot of faces lately and I decided to translate one into fabric. Everything went smoothly until it came time to do the facial features...I just couldn't figure out out to hand applique them using my favorite technique (freezer paper on the wrong side of the fabric), so, I fused them into place. I really didn't want to fuse, but it was the only way to get this impromptu project off my plate and into the "almost finished" pile. I haven't finished the raw edges of the fused pieces (still thinking about that) and she still needs to be squared up (cropping is such a wonderful thing!). Stripes...Too Much of a Good Thing! I 'll have to admit that I love quilts with a little "dissonance". I think this design that I came up with yesterday had just a tad too many stripes. It sort of looks like something you'd see at an exit on the interstate, right? Not too bad by itself, but not really a pretty block. Oh my stars!!! This thing makes me dizzy every time I look at it! I know the contrast of black and white adds to the dizziness of the design but even when I tried other light shades, the effect was the same. Several months ago, I sent in a little quilt to Ami Simms' Alzheimer's Art Quilt Initiative. Donated quilts are auctioned off/sold to raise money for research. At the time I sent mine in, I didn't have any personal connection with this terrible disease. Now, things have changed. My mother's sister is dying. Hospice has been called in and they don't expect her to last much longer. She has congestive heart failure. She also has Alzheimer's. I recently learned that my little quilt is one of 1,077 quilts that are going to the Houston International Quilt Festival, October 14th - 18th to (hopefully) be sold to raise money for this wonderful cause. I get a lump in my throat every time I think about my little quilt and my aunt. My quilt features a heart, my aunt has heart failure. My aunt has Alzheimer's, my little quilt will be sold to raise money to fund the research needed to find a cure for this terrible disease. As I mentioned earlier, I didn't know about my aunt's condition at the time I sent my little quilt in. If only I could change the dedication...I'd dedicate it to her strength and courage in what may possibly be the last few days of her life. 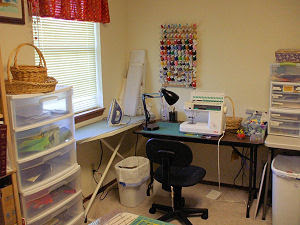 Since I've just straightened up my sewing room/office, I thought I'd share some photos of where I work/play! View #1: Cutting table and computer area. 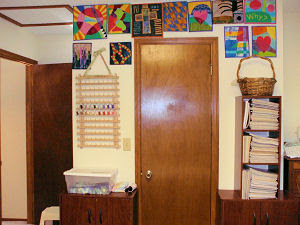 Small design wall made out of a large picture frame that is covered in batting and gridded flannel. Two filing cabinets...the one next to the computer actually holds files. The second filing cabinet holds fabric. I've placed plastic drawer units under the cutting table (in the foreground) that hold smaller pieces of fabric. This corner is where I create BlockCentral.com! View #3: Bookcase holds my quilting books along with other books I like to keep nearby. Note my collection of "For Dummies" books at the bottom of the photo...and yes, I do have a copy of "Quilting For Dummies"! 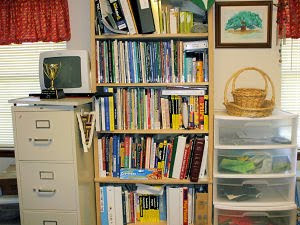 The filing cabinet next to the bookcase holds my collection of Quilter's Newsletter Magazine. The ENTIRE file cabinet is full of QNM and I still don't have every single issue ever published! View #4: There is a little recess that holds my embroidery machine on the chest in the corner. I don't use it a lot, but it is always ready to go when I have a project for it. I keep embroidery supplies in the top drawer of the chest, there are quilts in the remaining drawers. Next to the chest is another collection of quilt magazines that I just can't seem to part with. View #5: Behind the door is a closet that is packed with batting, really big pieces of fabric, and all kinds of odds and ends. It is not very tidy at the moment so I'll keep the door closed!. The mostly empty thread rack is my small but growing collection of Mettler Silk Finish thread. Love that thread! I buy it from Karen Kay Buckley. She has grouped the thread into collections of 5 spools each with oh-so-witty titles. I just love them! 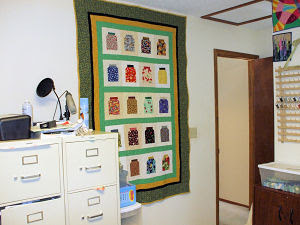 The double door cabinets on the floor hold more quilts and larger yardage. The plastic bin box on the cabinet to the left of the closet holds my 1/2" hexagon project that will probably take me YEARS to complete. It is my current take-along project and I have great fun working on it while waiting in the carpool line at school. On the wall are some weird little quilts that I've made. To have and maintain a clean workspace is a major accomplishment for me. I was voted "Messiest Desk" by my classmates in the 6th grade (much to my mother's chagrin). I guess I've tried to live up to that title ever since. That is until I watched the show Hoarders on A&E. Wow! I realized that my sewing room was headed in that direction and that I'd better do something about it right then! What a great motivator that show is, at least for me! Any way, I'm thrilled about my "new space" and feel like I've got things placed where they will be most useful and efficient. 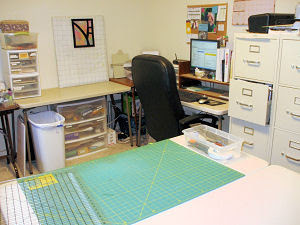 It took lots and lots of scouring the internet for photos of other quilters sewing spaces to come up with the layout of my room and for that reason I'm adding my photos to the mix just it case it might help someone else. 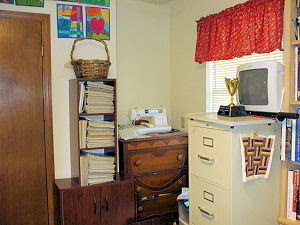 If you want to see some great sewing rooms, just Google it and click on "Images". Wow! Eye candy! Here is a peek at what I've been working on this week. It's my FIRST hand applique project! 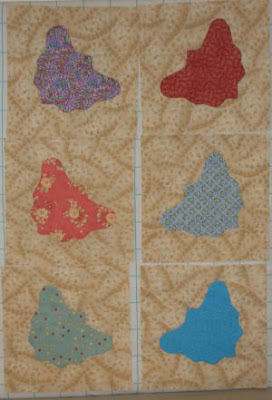 I've had a love/hate relationship with hand applique ever since I began quilting 20 years ago. I LOVED it and WANTED to do it, but all of my work really looked bad. Since I'm a confirmed perfectionist when it comes to sewing, each attempt ended up in the trash. I decided that I just wasn't cut out for it and didn't try again until this week, when I came across this wonderful tutorial from Rose Rushbrooke. I tried it and it worked! 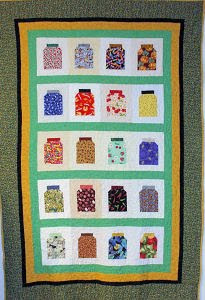 This Jar Quilt was given to me by some very wonderful friends on BlockCentral's Quilting Forum almost a year ago. I was going through a tough time and this gift was such a blessing. I have treasured it ever since! Words can not express what this quilt and the ladies who made it mean to me! 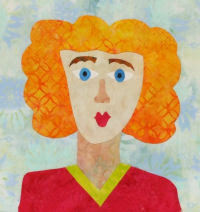 I'm the owner/editor of BlockCentral.com, a quilting website that has been serving quilters around the world since 1998.